The biggest factor when harvesting okra is the size of the pod. The younger and shorter the pod, the more tender it will be. Ideally, the pods are ready for harvest when they are 2-4 inches long. You can harvest when they are shorter, but it's inefficient. If you wait too long to harvest, the pods will be several inches long and they will be tough, fibrous and almost inedible. 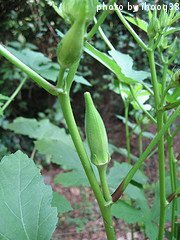 If left alone, okra pods will grow to 12 inches long, or more. When picking okra, you'll need a sharp knife of pair of shears. Cut the stem about 1/4 inch above the pod and place it in a basket or other container. The more okra you pick, the more your plants will produce. When the plants are in full production, it's a good idea to harvest every 2-3 days. 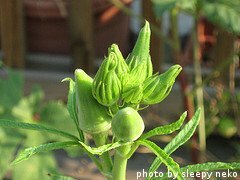 During peak season, okra pods will grow fast, going from a bump to a full-sized pod in just a couple of days. Okra plants will generally keep producing throughout the growing season as long as you keep harvesting okra pods. Production will finally slow down when cool weather sets in or when you stop harvesting. Okra plants have stiff hairs on their leaves and these sometimes irritate a person's skin. If you have sensitive skin, it's a good idea to wear gloves and a long sleeved shirt when harvesting okra. In warm climates, okra plants can reach 6 feet tall or more. If they begin to shade other plants in your garden, you can prune the tops a little. This also makes reaching and picking the pods easier. After picking okra, don't wash it or cut it. Put it in plastic bags and store it in the refrigerator. It will last 3-4 days. If you want to store okra for several months, it can easily be frozen. Just wash off the pods and cut off the stems. Plunge the whole pods into boiling water for 3 minutes and then transfer to an ice water bath to cool thoroughly. This will stop the cooking process. The okra pods can then be drained and packed into air tight bags and placed in the freezer. They will last for up to 9 months. At the end of the growing season, okra plants can be pulled out the ground. 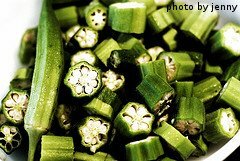 Because they are so woody and fibrous, okra plants should be chopped up into small pieces before being added to a compost pile. Now that you've picked some okra, it's time for a few of our favorite okra recipes.